I recently built a new barn in Texas where 105 degrees is a regular event in the summer. Before I built, I toured a number of barns in the area for barn design ideas. I visited some gorgeous barns that I could only dream about owning. While I was checking out barns, something that amazed me is how certain design elements could increase the comfort level of the temperature inside the barn. I also discovered that many people didn’t take the climate into consideration when they designed their barns so they missed out on incorporating something that might not add any cost to their barn, but could make a substantial difference in how comfortable the barn was in the warmer seasons. I saw a number of barns that would have been more appropriate for a cold New England climate than in Texas. This made me think that some people may really not think much about building for climate when they are designing their barns. 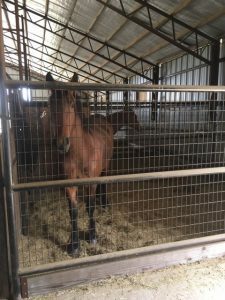 They might be focusing on the size of the stalls or the color of the tackroom walls and completely disregard elements that could increase ventilation, reduce inside temperature, and generally make working in the barn more pleasant. If you’re in the barn design phase and live in a hot climate, I’ve compiled a list of barn design elements you might find helpful to think about before you break ground. If you’re going to build a barn anyway, considering climate early could increase your happiness with the barn. Here is a list of barn design elements to consider when designing a barn for a hot climate. 1. High roof – Warm air rises. Give it a place to go that is out of your work zone. Low roofs trap hot air in the main area and can turn a barn into an uncomfortable sweltering oven in a hot climate. Adding clerestory windows that open provides extra light and a way for the hot air to escape. 2. Cupola & Exhaust fan – Give hot air a place to go. A Cupola in the roof with an exhaust fan can draw the hot air out of the barn and pull in cooler air. If you have ever had a whole house fan you probably know how effective these are to replace air in a structure. They work better than ceiling fans which just move air around without getting the hot air out. 3. Light color on roof and exterior – light color reflects heat. Every little bit helps in a hot climate. 4. Insulated roof – a must for helping keep it cooler inside a building. Also helps keep noise down when it rains. If you can work it into your budget, go with insulated walls too. 5. Covered Porches – these are wonderful shelters to keep the air around the barn cooler and provide a shaded place for horses to stand besides their stalls. A shaded porch also makes a great place to saddle and groom a horse out of direct sunlight. 6. Plant shade trees in the area around the barn. Yes, you will have to fence off the trees or the horses will eat them, but the trees can provide cooling shade on the barn and the surrounding paddocks. 7. Face angle of the summer cross winds -Taking advantage of natural ventilation was a tip my farrier mentioned to me when I was walking my land to decide which angle to place the barn. I was very focused on drainage which is important, but my farrier mentioned to me to alter my barn direction slight so I’d catch the summer breezes. Since I hadn’t started building yet, it was a no cost modification to move the angle of the barn slightly and its paid off. My new barn stays more comfortable because we get the summer cross breezes now. 8. Wide doors with air flow gates to increase ventilation – good air flow is the secret to keeping a barn comfortable in a hot climate. As much as you can, make it so air can enter the building. 9. Stalls open to outside – All my stalls have two doors. One doorway into the aisle and one doorway to the outside. This allows me to use my stalls as places of refuge that my horse can escape to when biting flies or too much sun drive my horse inside. I let my horses have free access to their stalls. If you only have stall doors to an aisle, you never have the free access option. 10. Stalls with lots of air flow. Allowing air to move makes for a more comfortable barn. Stalls with bars or wire fronts or sides allow for better air flow and ventilation. Also, since horses are social animals, they often get less anxious when they can easily see their own kind. They like to be able to communicate with their kind in the next stalls. It you go the wire link sides, make sure you put a solid divider near where you feed in the stall so an aggressive horse doesn’t keep a more passive horse from eating. 11. Overhead fans. These can make your horse’s life so much happier. I’ve seen many horses position themselves under a fan and go to sleep. They love fans. The moving air also helps keep insects off your horses. 12. Add solar protection to any windows that get direct sunlight. Tack rooms frequently have windows and many people don’t put anything over the windows to limit direct sunlight. This can heat up a room substantially. If you’re designing a tack room, think twice about adding a window in the room. Windows can be a security risk to expensive saddles and also a source of heat from direct sunlight. If you must have a window, be sure to incorporate solar protection. All barns are hot in the summer, but when ventilation is optimized and passive cooling measures like shade trees and porches are in place, your barn can still be a place of relative comfort and a welcome relief from the sun. Horse Barn Design, Layout and Planning.